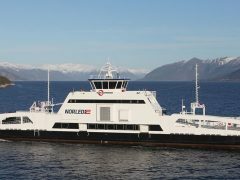 Scandlines’ hybrid ferry Prinsesse Benedikte goes back on stream this week and its two long-delayed hybrid newbuilds Berlin and Copenhagen are also finally expected into service soon, writes Tom Todd. The 14,822gt Prinsesse Benedikte has been at Poland’s Remontowa yard since March for repairs after a floating dock keeled over during the ship’s docking-out. The accident followed three weeks of work that included installation of a new diesel, radar and ventilation systems and scrubber plant plus coating. 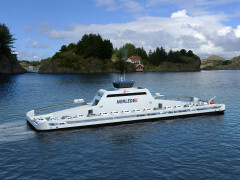 Built with Mak 8M32 and MAN 6L32 diesel-electric propulsion, the 143m Prinsesse Benedikte was retrofitted in 2013 with a diesel and electric hybrid propulsion system using Corvus AT6500 lithium polymer battery packs.